Special Thanks to Ken Akopiantz! 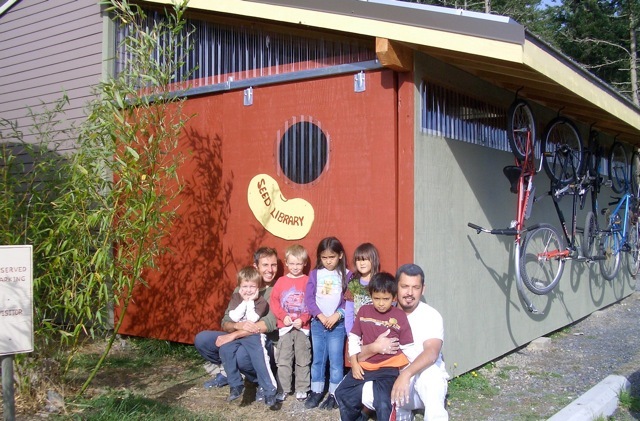 Ken Akopiantz of Horse Drawn Farm and LCLT’s former seed librarian published LCLT’s Seed Library Catalog and Lopez’s own first Seed Exchange Catalog. These are due to be updated annually by volunteers – we always need help at the Seed Library! Remember that all seeds are free. Become a part of preserving the heirlooms of yesterday while breeding the heirlooms of tomorrow. We encourage home gardeners to save seeds from the “easy” plants: beans, peas, lettuce, and tomatoes. Do not save seeds from plants in the “difficult” or “expert” drawer until you have more experience seed saving. We ask that participants become an annual LCLT member (minimum $10/year), and attend an orientation of the facility either online or from a Seed Librarian. We provide free classes on seed saving, seed cleaning equipment, and access to many educational resources. Our Mission: Lopez Community Land Trust Seed Library is a community seed project committed to increasing the capacity of our local food system by providing island appropriate open source seeds, while fostering community resilience, self-reliance and a culture of sharing. Hours: Monday- Friday 9-5. After attending an orientation or thoroughly reading our online orientation, you can come down any time the LCLT office is open and “borrow” seeds. Remember to “check out” seeds using the Membership Forms in the blue binder. 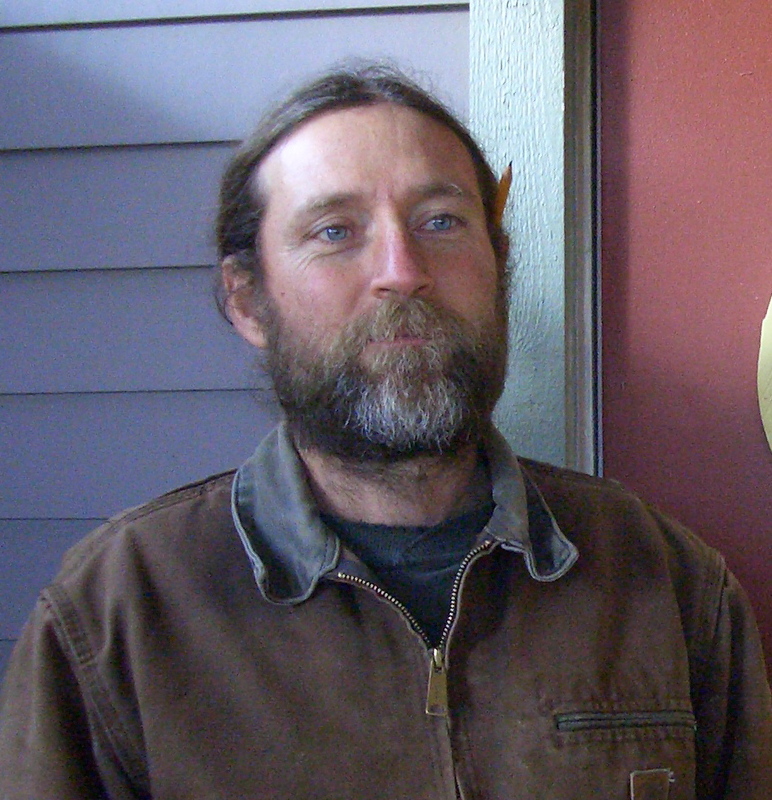 Support: We would like to thank all of the seed stewards on Lopez Island for sharing your seed, this is a priceless gift to your community and a vital step towards a more sustainable future; to David Zapalac for designing and building the LCLT Seed Library, it sure is cold, dark, and dry in there! ; to the generous LCLT Members and Donors; and to Richmond Grows Seed Lending Library for providing so many resources to get our library going. Thank you all! Our Seed Garden: LCLT is currently creating a seed garden at Common Ground. Come visit the Seed Library for an orientation by one of our seed librarians, then come to the library to “borrow” seeds any time the LCLT office is open. You can “borrow” seeds from any drawer, but when you first get started, only save seeds from the “easy” shelves. The idea is that people learn to save seeds and return some for others to use. Don’t save seeds from the “difficult” shelves for the library until you have learned more about seed saving. Visit our Seed Saving Resources page for tips on how to save seeds so you can return seeds at the end of the season for others to borrow. We also offer free classes on seed saving, which will be listed on our home page. Thanks for being a member of our community seed library. Fill out the Membership Form at the seed library. Using the Seed Stamp, stamp and fill out a separate envelope for each type of seed you plan to take. Put seeds in envelopes. Take 2-3 seeds fore every plant you intend to grow this season. Read the LCLT brochure and learn how to properly save seed. Save quality seeds for yourself and the library. Bring the seed to the Seed Library and find a suitable glass jar to store seeds in. Fill in Seed Stamp. If you need more space for notes, there are additional notes stamps (Notes are very important, please be thorough so others know what they are growing). Tape Seed Stamp to jar well. Notes: Indeterminate, Beefsteak, Unbeatable flavor! Thank you for saving seeds! The Seed Library is organized by plant family. Exceptions are the herbs, flowers, and native plants, which are lumped together. 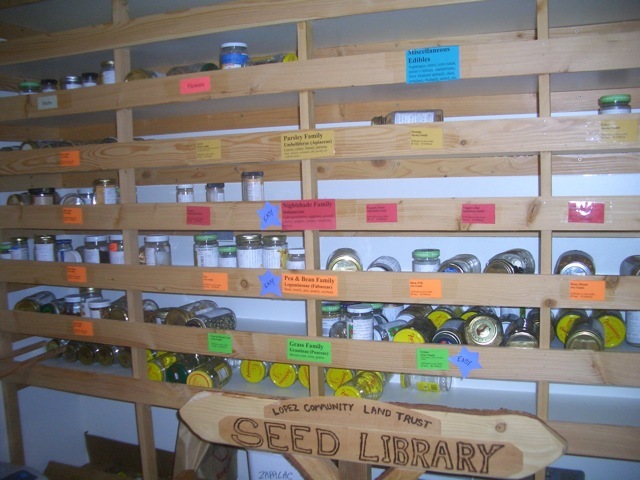 Each shelf is labeled “easy” or “difficult” based on the effort required to save the seed properly. When bringing seeds to share, read Seed Saving Protocol below to make sure we have a healthy and genetically diverse seed collection. The USDA has a search system that will help you find the current scientific name of different plants. Or look it up in the Seed Savers Exchange booklet or Seed to Seed, both available at the Seed Library. Seeds require different levels of work, experience and space to save. So what are the best seeds for you to save? We encourage people to start with what we’ve labeled as the “super easy” plants. We ask people who check out seeds to grow them organically for your benefit and the benefit of others. These seeds can most reliably be saved by the home gardener, even if you’ve never saved seeds before. Some plants are biennials, which means they produce seeds the second growing season. These are still suitable for some beginners. The issue is do you have the space! Many of these require large populations and isolation from things that could cross-pollinate with them. Check out the resources on our Seed Saving page. Check with a seed saving chart or book to get isolation distances. We all save seed from a favorite that might not be from a number of plants or isn’t super healthy, or maybe we like some interesting crosses. You are welcome to bring those seeds just make sure you write that down on the label so others know they are participating in your experiment. Properly saved: Only return seeds from plants that you know how to save properly. “Easy” seeds can be fairly reliably saved without cross-pollination (and unintentional hybridization). Some “easy” seeds include tomatoes, beans, peas, lettuce, arugula, and dill. Do not return seeds from the brassica (ex. broccoli, cauliflower, kale, brussel sprouts, cabbage) or cucurbit (ex. cucumbers, squash, melons) families unless you have taken appropriate steps to prevent cross-pollination, such as hand pollinating. Adaptive Seeds has a great seed saving booklet you can download for free. Seeds Trust, a company that specializes in seeds for high altitude gardens and the Southwest, has a fabulous free downloadable seed saving book. You can also purchase a hard copy for $3. Very worthwhile! They offer a Seed School (now through Native Seeds/SEARCH) for a deeper learning opportunity. Organic Seed Alliance has a free seed saving book that is downloadable. Seed Savers Forum – ask the experts! The Seed Savers Forum allows you to ask experts questions about seed saving. While your at it become a member of Seed Savers Exchange and get access to thousands of varieties of vegetables, including unusual and rare varieties. Seed Saving Chart – easy reference chart of plants by cycles, type of pollination, length of seed viability. Visit our page on what type of seeds you should borrow based on your level of experience and commitment to learning. Salt Springs Seed Saving and Cleaing videos – huge collection of free videos!